At the end of April I rented a car with two Tom and Veira, two people I work with. 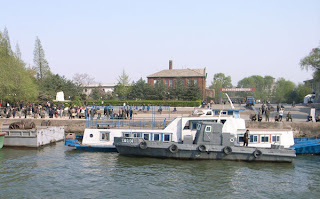 We drove for 3 hours to Dandong, the border town with North Korea, where the two countries are separated by the relatively shallow Yalu River. I thought I’d be able to find some North Korean products to sell online, but I didn’t come across too much and most of it is of questionable origin—as it’s easier and cheaper to make a fake memorabilia in China than it is to import from North Korea. 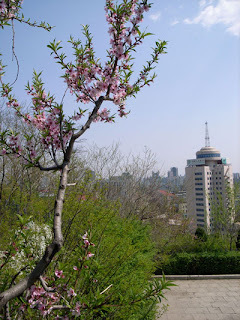 Much of the trees were in bloom in China; looking through Dandong’s development towards the empty hills of North Korea. 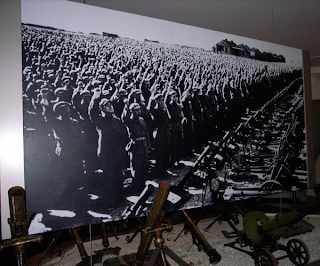 There is a very large Korean War Memorial, to commemorate the million strong yet poorly equipped “volunteer” peasant army that was sent in to fight against the UN Coalition troops. 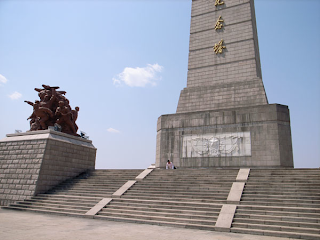 Its construction was finished in the 1980s as the General of Chinese Communist Forces made it into Mao’s bad-books and work was halted until after Mao’s death. 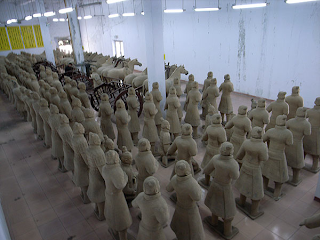 Perhaps the commemoration of the Korean war isn’t enough so they’ve put in their own Terra Cotta army. There’s a good parallel between the ruthless Qin Emperor—who was the first to unite China but under measures of extreme force—and the Iron Fist that was to run China up until 1976. 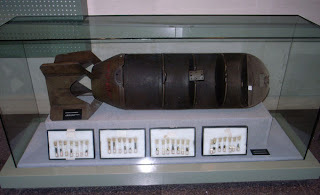 Both North Korean and China tend to show off these germ bombs which the U.S. apparently had been using. While wrapping up World War II in China, the Americans captured the Japanese Unit 731 which had been conducting biological experiments outside of of the big Manchurian city of Harbin, yet the leaders were pardoned as they handed over their research. Apparently years later the Americans were dropping plague-infected insects during the war. It’s unclear to me if this actually happened, if this is North Korean agitprop, or if the Americans were conducting psychological warfare, but likely there’s truth to all three. There’s no doubt that the Americans did pound all North Korean buildings and bridges with explosive bombs. On the right is what remains of the original bridge, with only the Chinese side upon which I was standing still intact. 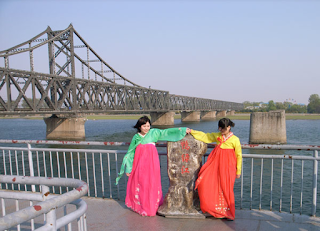 Back in 2002, I crossed the newer bridge on the left to enter North Korea. 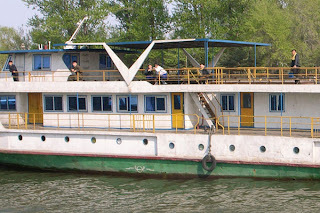 It’s possible to charter a boat for a twenty minute tour of the North Korean coast along the Yalu River. We didn’t want to wait for a critical mass of tourists as there weren’t many wandering around so for $16 the 3 of us took out a boat that would fit about 100. 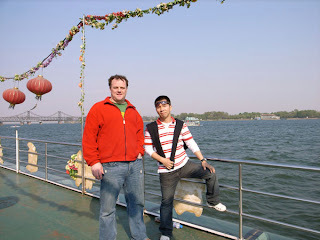 We were brought remarkably close to North Korea, technically into North Korean waters. The two girls in the middle excitedly waved just before I took this picture, but the boat was slow and the excitement soon wore off. Likely this small port has looked the same since the 1950s. Below, I noticed that our boat was being video tapped by soldier on this North Korean Coast Guard ship. I waved, and he did put down the camera to enthusiastically wave back, but then seemingly remembering his station, he picked up the camera, quickly glanced around to see if anyone had noticed his lapse, and resume video tapping. 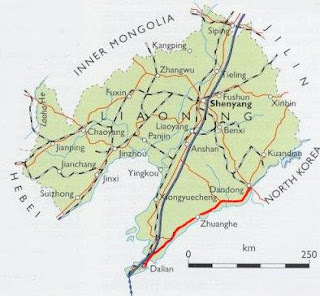 These North Koreans along the shore have witnessed China’s rapid development, as shown below. 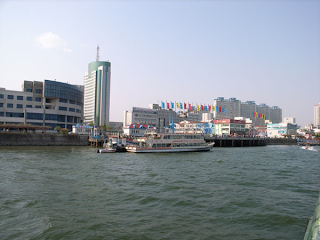 Many of these new buildings in Dandong weren’t there back in 2002. 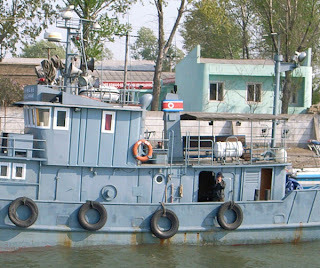 Our nearly empty boat was the same size as below, so we managed to get a lot of attention from those milling about in North Korea: a big guy wearing a red jacket on top of an empty boat definitely would have stood out from the blandness. We finished off the day at a North Korean restaurant on the Chinese side—run and operated by North Korea. Those fortunate to work abroad are rotated through the North Korean restaurants in China plus the two big hotels in Pyongyang. The germ bombs were real. i'm not quite finished with this but have a looksee. Pick up Thomas's book if you can, it's one of my most revealing and most treasured. Thanks for blogging, i'll be peeking in!